The southern entrance to Hailey welcomes visitors to a diverse and dynamic city, active in sports and in touch with its history. After many years of transformation, Hailey’s Werthheimer Park is coming into its own as a recreation and entertainment destination. By next year, a major ice-hockey and skating venue will be added to the site, alongside the existing multi-purpose arena, visitor center and world-class skatepark. Formerly known as the Hailey Rodeo Grounds, Werthheimer Park was bought in 1913 with a $1,000 donation from Hailey National Bank director Leopold Werthheimer. The first use of the land was for horse racing and baseball. In 1947, the Sawtooth Rangers riding club gathered donations, supplies and manpower to build a rodeo arena for the Wood River Roundup. Hollywood actor and rodeo star Slim Pickens performed at one of the earliest Hailey rodeos. The rodeo was christened as the Days of the Old West Rodeo in 1970 and has been a mainstay of the city’s Fourth of July celebrations ever since. As the city’s population increased, recreational interests expanded. In 2003, a world-class skatepark was built on the site, drawing professional skateboarders from around the world, including Tony Hawk, Christian Hosoi and Bam Margera. 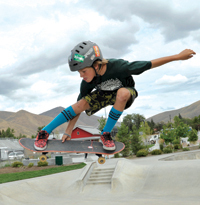 “The skating community raised $700,000 to build the park,” said Lamar Waters, a Hailey Parks and Lands Board member who has organized annual skatepark competitions for three years. Jedson Waters, 12, trained in Hailey and has now won national championships three years in a row in his age group. In 2008, a citizens’ survey found that Hailey residents wanted to expand and renovate the park. In 2010, more than two-thirds of Hailey residents voted to raise their taxes for 10 years to help pay $3.5 million to build a new, multi-purpose rodeo arena, interpretive and visitor center and to expand the skatepark. The Hailey City Council also made room for Hailey Ice Inc.’s new ice rink on the 5.2-acre site, giving a home to a nonprofit organization determined to bring an ice skating venue to the south valley. In 2011, the $187,000 skatepark expansion brought new terrain for beginner and intermediate skaters to get in on the act. The new terrain is considered a tribute to skateboarding’s urban heritage, with some rural Idaho twists. A totem pole of native wild animal species reaches up from the concrete slopes. The 3,500-seat rodeo arena was completed in 2011. Since that time, major rodeo and bull-riding events have taken place there. Most recently, the arena has become a hot location for Mexican rodeos, or charros, bringing a multi-cultural influence to the site. The arena has also played host to circuses and reggae and country music concerts. Later this summer, the city plans to install an archery range in the arena. After 15 years of fundraising, Hailey Ice Inc., a grassroots hockey and skating club, received a $4 million donation earlier this summer to complete a covered and refrigerated ice rink at Werthheimmer Park. The $5.5 million project, when it is completed in 2015, will be the crowning success of the vision for Werthheimer Park. The rink is expected to bring hockey tournaments and a boon to local businesses. Hailey residents also supported in 2010 construction of an energy-efficient (LEED-certified) Hailey Visitor and Interpretive Center, which now houses the Hailey Chamber of Commerce. The Visitor Center displays the story of the Hailey Rodeo Grounds from its origins to present, and also showcase the city of Hailey’s leading role in passing green building initiatives in the Wood River Valley. Numerous local artists, including Bill Amaya and Tom Teitge, beautified the building with murals, sculptures and functional works of art. In addition to numerous online and telephone communications, the Hailey Chamber welcomes about 1,200 walk-in visitors each year. “It is great to be located here in the middle of where everything is happening,” said Hailey Chamber Manager Geegee Lowe. This summer, the Visitor Center is hosting “Hometown Teams,” a traveling exhibition from the Smithsonian Institution in Washington, D.C. The exhibit, which shows how sports have shaped America and the Wood River Valley, is open to the public and admission is free.